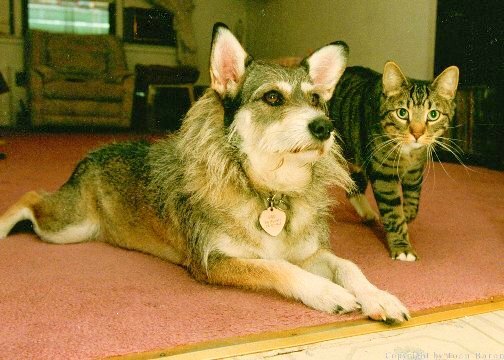 Many of you may be familiar with Ginny, the Schnauzer/Siberian husky mix whose life-saving skills were legendary. When she was adopted from a shelter, she paid the good deed forward by seeking out and saving sick and injured feral cats. She saved upwards of 900 lives before she died at age 17 in 2005. Ginny was discovered by the landlord of an abandoned apartment. She and her three puppies were locked in a closet with no food or water for about a week. Shelter vets thought that she might be beyond saving, and contemplated euthanasia. But they had a change of heart, and gave Ginny a chance. Once they were healthy, she and her puppies went up for adoption. When Philip Gonzales adopted Ginny from the shelter in 1990, he knew she was special, but had no idea just how remarkable she was. Philip was actually her first rescue. He was battling with depression after suffering an accident at his job as a steamfitter in Manhattan that left his right arm with little use. Philip’s neighbor, Sheila Harris, persuaded him to adopt a dog to lift his spirits and give him purpose. At the shelter, he set his eyes on a Doberman, but was thoroughly disappointed when someone else adopted it. A shelter worker suggested he take Ginny on a walk, and he did so reluctantly. Outside, she seemed to sense his disappointment, and refused to move until he looked her in the face. From that moment on he was bewitched by the little dog. 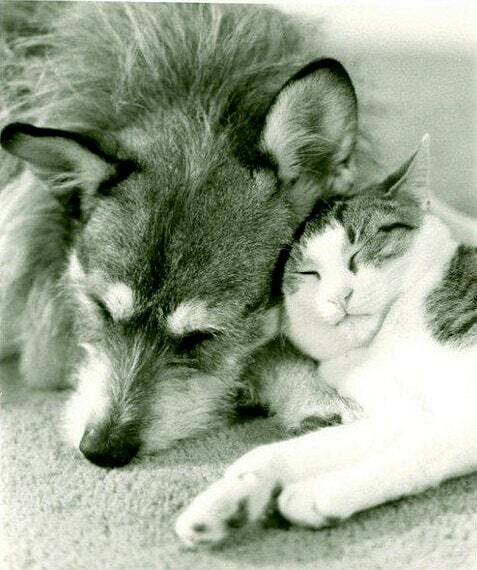 He soon found out that Ginny had an incredible instinct for finding stray and feral cats. 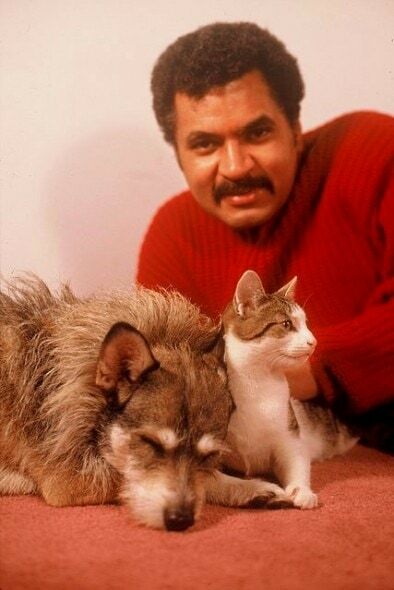 But not just any cats – only the ill and injured ones. She sniffed out alleys, abandoned buildings and construction sites. Perhaps having been found under the same circumstances, she made it her mission to make sure others didn’t suffer, scared and alone. Any person who has ever tried to rescue a feral or timid animal knows how difficult a task it is. For a dog, who may be regarded as a predator or adversary to wild cats, to gain their trust is nothing short of phenomenal. Her first feline rescue was for a litter of five helpless kittens trapped in a pipe. While out for a walk, Ginny dashed off. When Philip caught up, she was urgently scratching at a pipe. She continued to paw at the pipe until it fell, and the kittens tumbled out. She had a peaceful air about her, and put cats at ease. They showed no fear or aggression toward her; it was as if they had known her their entire lives. 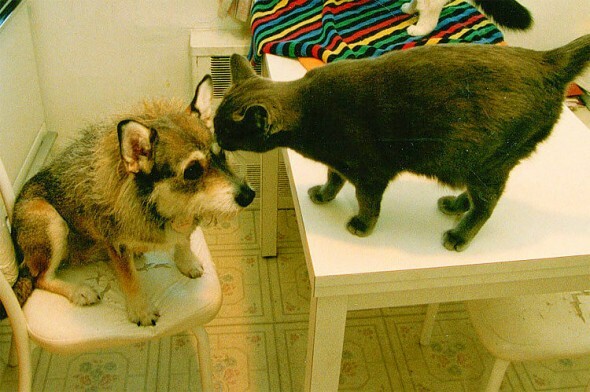 Overlooking the peril she often put herself in, Ginny scoured dumpsters and glass-filled containers – and sometimes glove compartments – to find cats that needed her. A few weeks after her adoption, Ginny and Philip went to the shelter to donate dog and cat treats. Ginny snuck away. Philip found her begging in front of the kennel of a one-eyed cat. 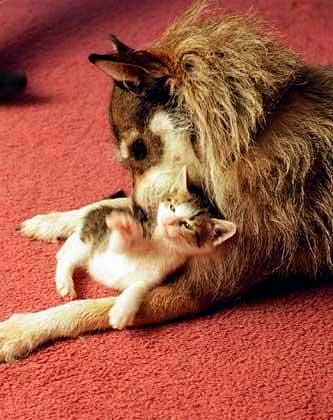 He adopted the cat for her. The next week, Ginny came across another cat, which Philip knew had to be made part of the family. 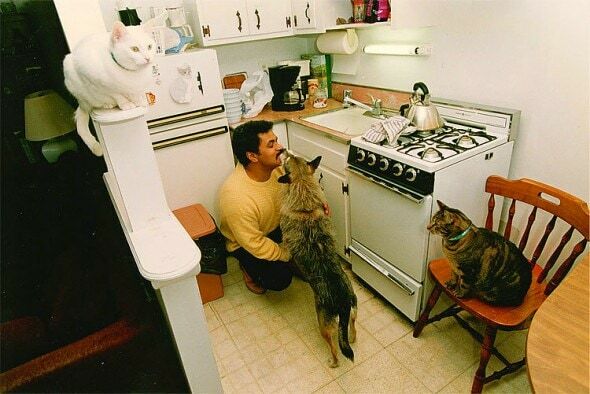 A few days later, he found out the cat was deaf. Animal behaviorists believe she had an overly-active maternal instinct, but to those she saved, she had just the right amount. 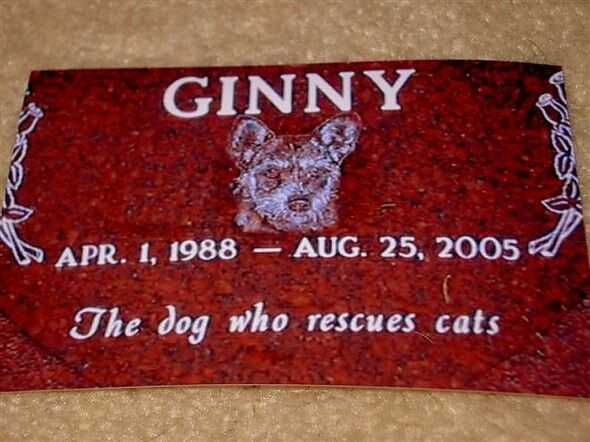 Ginny’s drive to save lives was not limited to cats. On one occasion she came to the rescue when a blind man nearly stepped off a curb into high traffic. She leaped off the curb first and barked at him until he turned around. In 1998, she was named Cat of the Year by the Westchester Feline Club in homage to her lifelong heroism. 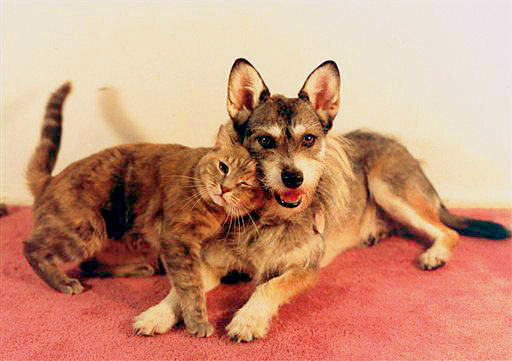 Philip and Leonore Fleischer penned two books about her: The Dog Who Rescues Cats: True Story of Ginny (1995) and The Blessing of the Animals: and The Blessing of the Animals: True Stories of Ginny, the Dog Who Rescues Cats (1996). She even has her own website, featuring The Ginny Fund, which allows Philip to continue helping the stray and feral cat population of Long Island. Philip made the difficult decision to put her to sleep at age 17. She was incontinent and arthritic, but when she stopped eating he knew it was time. Though Ginny’s being gone still saddens many, it’s made bearable knowing that she lived a full life and saved the lives of hundreds of others, thanks to the staff who decided she was worthy of saving. Adopt a shelter dog today – they are truly miracles.